The ability of manure to maintain or build soil organic matter levels has a direct impact on enhancing the amount of carbon sequestration in cropped soils. Overview of Manure Impacts on Soil (Mark Risse, University of Georgia). Visit the archived webinar for additional videos on carbon, fertility, and soil health. 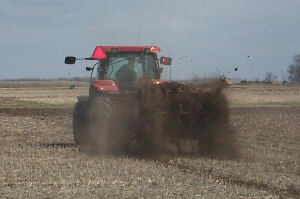 In addition, surface application of manure behaves similarly to crop residue. Crop residue significantly decreases soil erosion by reducing raindrop impact which detaches soil particles and allows them to move offsite with water runoff. Data has been published showing how manure can coat the soil surface and reduce raindrop impact in the same way as crop residue. More… Therefore, in the short-term, surface manure applications have the ability to decrease soil erosion leading to a positive impact on environmental protection. In addition, organic N (manure N tied to organic compounds) is more stable than N applied as commercial fertilizer. A significant fraction of manure N is stored in an organic form that is slowly released as soils warm and as crops require N. Commercial fertilizer N is applied as either nitrate or an ammonium (easily converted to nitrate). Nitrate-N is soluble in water and mobile. These forms contribute to leaching during excess precipitation (e.g., spring rains prior to or early in growing season) or irrigation. Manure N’s slow transformation to nitrate is better timed to crop N needs, resulting in less leaching potential. In fact, manure N is a natural slow-release form of N.
It is important to remember that the environmental benefits of manure outlined in this article are only beneficial when best management practices for reducing soil erosion are implemented in concert with proper levels of manure nutrient application and use. Ontario Ministry of Agriculture, Food and Rural Affairs (2015) What is the Impact of Manure on Soil Organic Matter?